You don't need to be a trained soldier to fully appreciate this edition of the U.S. Army Improvised Munitions Handbook (TM 31-210). Originally created for soldiers in guerilla warfare situations, this handbook demonstrates the techniques for constructing weapons that are highly effective in the most harrowing of circumstances. Straightforward and incredibly user-friendly, it provides insightful in… formation and step-by-step instructions on how to assemble weapons and explosives from common and readily available materials. Over 600 illustrations complement elaborate explanations of how to improvise any number of munitions from easily accessible resources. 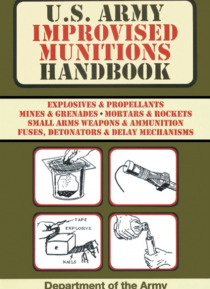 Whether you're a highly trained solider or simply a civilian looking to be prepared, the U.S. Army Improvised Munitions Handbook is an invaluable addition to your library. The U.S. Department of the Army is headquartered at the Pentagon in Arlington, Virginia, and authors The Soldiers Guide, The Complete Guide to Edible Wild Plants, U.S. Army Ranger Handbook, U.S. Army Hand-to-Hand Combat, U.S. Army First Aid Manual, U.S. Army Weapons Systems, U.S. Army Special Forces Handbook, U.S. Army Guide to Boobytraps, U.S. Army Explosives and Demolitions Handbook, U.S. Army Special Forces Guide to Unconventional Warfare, and U.S. Army Special Forces Medical Handbook.